Per William's own handwritten summary of his vital facts, he states “...came to America 1832 to California 1842...”. Not much to go by. We now know that the account of his arrival in his son Alfred’s biography is incorrect on several counts. Per a ship's manifest, William first arrived in the port of New York on December 2, 1833, aged 18. Family lore, repeated in Alfred's biography, provides an account of his arrival in Texas that occured six months to two years after his arrival in New York. Per the family lore, he was aboard a ship that was wrecked by a storm upon the coast of Mexico; and, he next lived with the local inhabitants, native Indians or Mexicans, for several months. We do not know: (i) the name of the ship; (ii) where it sailed from; (iii) where on the coast of Mexico-Texas the wreck occured; (iv) how long he remained with the locals; (v) nor where he went when he left the locals. Per a study published in 1856 of the hurricanes that occured between 1498 and 1855, the worst months for hurricanes in the Gulf of Mexico were August, September, and October. William’s shipwreck likely occured no earlier than July, 1834 (aged 19), and no later than November, 1835 (aged 20) – it is unlikely his shipwreck occured in 1836 for he enlisted in the army of Texas on October 1, 1836. What do we know about William during this period, with reasonable certainty? He likely arrived in Texas after June, 1834, and several months before October, 1836. His ship was wrecked on the coast of Mexico. Physically, he was a 19 or 20 year-old youth. He had probably attained his adult height of 5'8" (1.73 metres), but had not yet filled out. He was fair-haired and blue-eyed. He probably displayed some of his later personality traits: intelligent, determined, hard-working. He was well-educated for that time, but probably not conversant in Spanish or English. Later in life, in 1874, he was described as very German. He was Roman Catholic (i.e., making him more acceptable as an immigrant by the Mexican authorities). He was unmarried (i.e., making him less acceptable as an immigrant by the Mexican authorities). He had been in Texas long enough to assimilate into the Anglo community and to sympathise with their views. He had Anglicised his name, changing it from Wilhelm Böniz to William Benitz (click here to see why). He enlisted in the army of Texas (October 1, 1836). He enlisted under the name William Bennett (or Bennetts) — a common misspelling of Benitz (click here to see more). Ten years later in California, shortly after it became part of the U.S., he signed a few documents using this name. Texas belonged to Spain until 1821, after which it became a state of Mexico. In 1827, Stephen F. Austin had begun settlements in Harris county (near present day Houston). The first few German settlers arrived there in 1831. 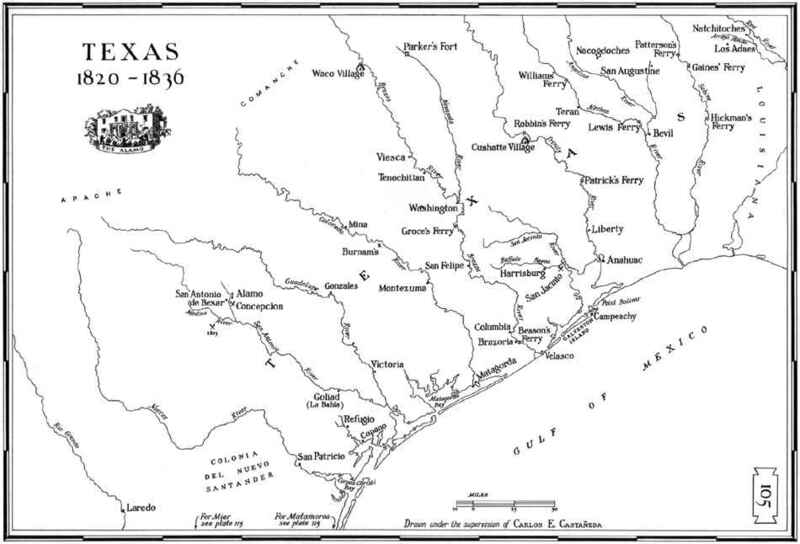 By 1830, Germans were settling between the Brazos and Colorado rivers east of Mina (now Bastrop, see map of Texas above). In 1835 when the Texans began their war of independence, the immigrant Anglo population outnumbered the native Mexicans by 10 to 1. It may not really matter exactly where William came ashore. He was a foreigner who didn’t speak Spanish nor English and hearing of the Germans in Texas he could very well have made made his way to join them. However, if he was already en route to join the German settlers when his ship was wrecked, then it seems more likely he was ship-wrecked on the present day coast of Texas. 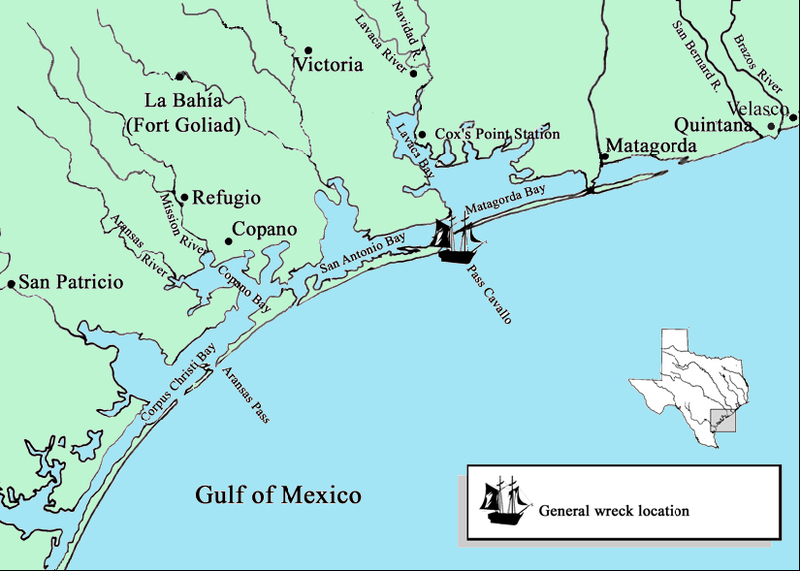 Amy Anne Borgens provides a list of the known shipwrecks that occurred upon the Texas coast during the early nineteenth century; see appendix IV of her MS thesis "Analysis of the Pass Cavallo Shipwreck Assemblage, Matagorda Bay, Texas", Texas A&M Univ., May 2004.